How does a law school dropout from Detroit end up a hotel partner in Belize? Stewart Krohn, 67, is a modern-day Renaissance man. 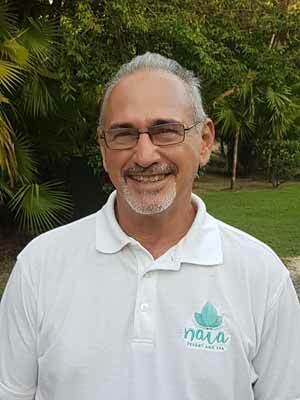 Before opening Naïa Resort and Spa in Placencia, Belize, Krohn worked as a first mate, a tennis pro, wrote for a magazine, started a magazine, became a television producer, and founded Belize’s first local TV station—sometimes doing two jobs simultaneously. Leaving Michigan for Belize. “I started law school at University of Michigan in 1972. When I got halfway through my studies, I decided to reward myself with a holiday. I had previously run into a fellow at the tennis club where I worked who owned a resort in Belize. He had a 50-foot sailboat. He said if I could find my way down there, the rest of the vacation would be on him. At this point in December 1973, the snow was three feet deep outside my window. I couldn’t call him, so I sent a cable, bought a ticket to go to Belize, and went out sailing for a week with this guy. When we reached the harbor after a week at sea—fabulous diving, fishing, the whole bit—he said his first mate was leaving, and would I like the job? For some reason I said yes, thinking this would be a one-semester leave of absence. One semester turned into a 44-year leave of absence.